Fridays are usually days for me to relax, I tried to have one day to do things I have been thinking of doing, but I never find the time for them, so today I decided it was going to be that day and I planned to do several little, quick recipes that you can keep in the fridge or cupboard for weeks or even months, so I am sharing the recipes with you. When I was a child, we used to have a big garden full of fruit or vegetable trees and my dad, who was a keen foodie, used to make good use of all those things we had in the garden, for example, he used to brine his own olives and he also used to make tons of salsa for the week and things like that, so I thank him for showed us how to store ingredients. So the four quick recipes are: “Jalapeños in Escabeche”, which are fresh jalapeños mixed with carrots, onions and cauliflower and pickled in vinegar and other spices, then a “fresh coriander mayo”, that was my dad’s favourite thing to do and he used to make lots of it, also I am making “arbol chilli salsa macha” which is lots and lots or arbol chillies in oil, garlic and sesame seeds and last a very useful “Mexican style pickled red onion”, which is very finely red onion pickled in vinegar. 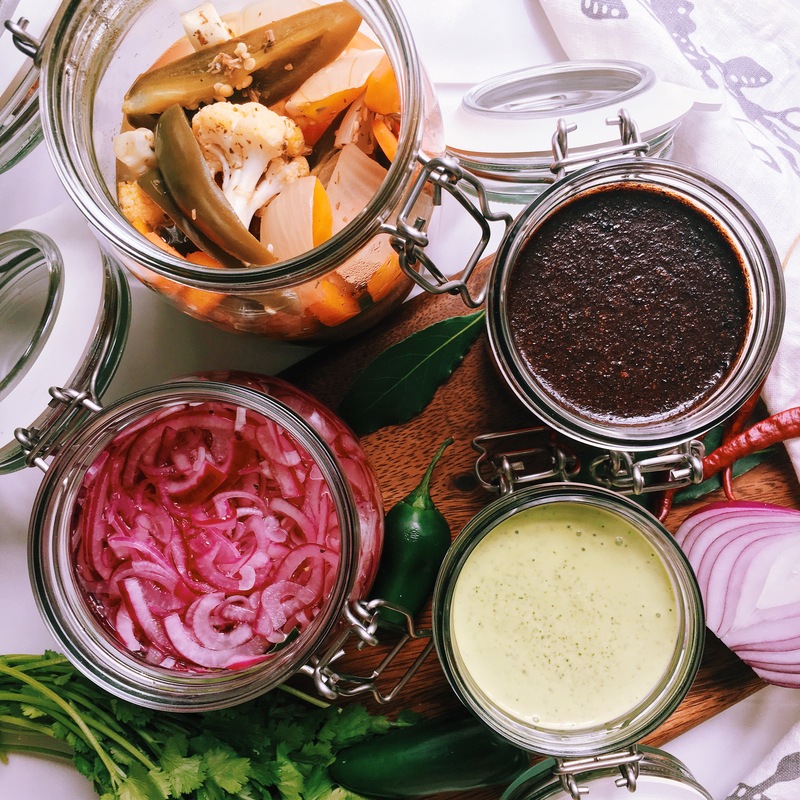 All these recipes can be used for many things, for example, I love eating the jalapeños in escabeche with cheese nachos! Or the coriander mayo with some yummy chips and the salsa macha with a good steak and the pickled red onion for shredded chicken tostadas or some cochinita pibil taquitos! The ideas are endless and when you have them all ready I honestly assure you that they won’t last long! 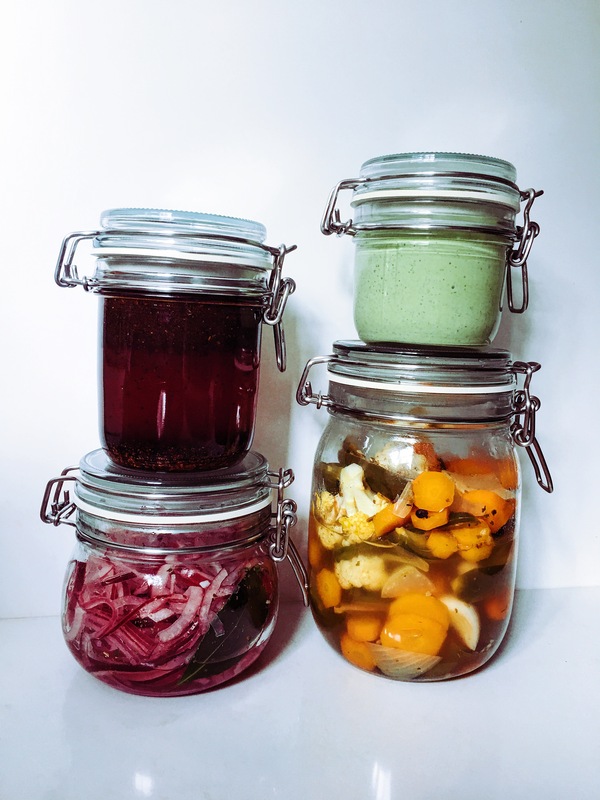 For these recipes you will need four pickling jars and you will need to sterilised them, what I do is, I wash them very well with soap and hot water, rinse them very well and then put them in the oven for around 15 to 20 min in a low heat. Do this first before you make the recipes, so you have them ready to be used! In a large saucepan heat the oil in medium heat, then add all the veggies and fried for 7 min. Add the vinegar, water, peppercorns, salt, bayleaves and salt and leave it to boil. Once starts boiling, turn the heat off and leave it on the side to cool down for 10 min. Put all the vegetables in the pickling jar and closed. Write the date they were prepared on the front and leave in the cupboard for until 3 months. Once open, store them in the fridge. For this recipe I recommend you to use a hand blender, as it is easier to control the texture of the mayonnaise. Put all the ingredients in a the hand blender container and blend until getting a smooth and creamy texture, just like mayonnaise. Pour it in a pickling container and store in the fridge for up to a week. This is a very easy recipe, but you have to be careful of not burning the chillies, because the salsa might turn bitter if the chillies are burn. Heat the oil in a frying pan, add the chillies and stir continuously for around 3 min. Once the chilli are ready, remove them from the oil and put them in the blender. Add the garlic and 1 tbsp sesame seeds, then add the oil from the frying pan and blend until everything is smooth. Pour it in the pickling jar and add the rest of the sesame seeds. Store in the cupboard for up to 3 months. Mix the vinegar, sugar, salt and oregano in a large bowl. Boil water and rinse the onion with it. Add the onion to the vinegar mix and mix very well. Put all the onion and bay leave in the pickling jar.